Jack Hemby, 76, was last seen leaving his girlfriend’s house in Ruidoso Downs in New Mexico on November 15, according to his girlfriend. The last contact he had with his family was November 9. His 1981 tan VW Rabbit diesel was found abandoned at the parking lot of the Inn of the Mountain Gods resort and casino on Mescalero Apache reservation. 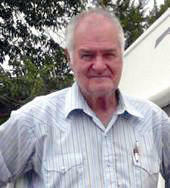 Jack is 5’11” tall, 190 pounds and has gray hair. If you have any information as to his whereabouts, please contact the Ruidoso Downs Police Dept. at 575-378-4001.
for your great info you have right here on this post. gracias. My dad Jack is still missing to this day have no leads, our family believe the girlfriend no's where he is dead or alive but she skipped town so a search for her has become our goal now!